No, it’s not the brownies you ate earlier: Harold and Kumar really ARE climbing out of the screen at you. The big screen’s dope-est duo is back together, fully baked for the holidays, and actors John Cho and Kal Penn are puffed up with pride over “A Very Harold & Kumar 3D Christmas" (opening this Friday). Cho: It is the greatest Christmas movie of all times because that morbidly obese, white man home invader finally gets his due. Penn: You cannot refer to Santa Claus in that manner – I won't allow it! What I love about this movie is that we get away with so much bizarre, graphic, sometimes vulgar humor and still retain the true Christmas spirit of friendship and family and love and Santa Claus. I love that we got to do both those things in one movie. Penn: I was a little trepidatious when we got the first draft of this script. I thought, 'Kumar is known for being gregarious and he's a little bit of a slacker.” But at this point he's down in the dumps, depressed: His girlfriend left him, he hasn't left his house for four weeks and he's a bigger stoner than we'd ever seen. Why? Talking to [screenwriters] Jon [Hurwitz] and Hayden [Schlossberg] about that, I realized that six years has past and much like a lot of people who saw our first movies when they were 22 – as were the characters – and now they're twenty eight, just to play with what happens in life, that being where it starts out and then they come back together was cool. Cho: And I thought the first movie was radical in the sense of how it approached race and the kinds of jokes that it made about race. Then the second movie was radical in the sense that to put a 'Harold & Kumar' treatment on essentially a political satire. I was worried about where you go after that, whether we could keep that particular thing going. I thought that it was unsustainable. So what I thought was equally radical about this movie was just to make a very traditional Christmas movie. Yes, it has naked nuns, and yes, it has a degenerate baby in it that does cocaine, but at its heart I think it's a sweet picture, really. 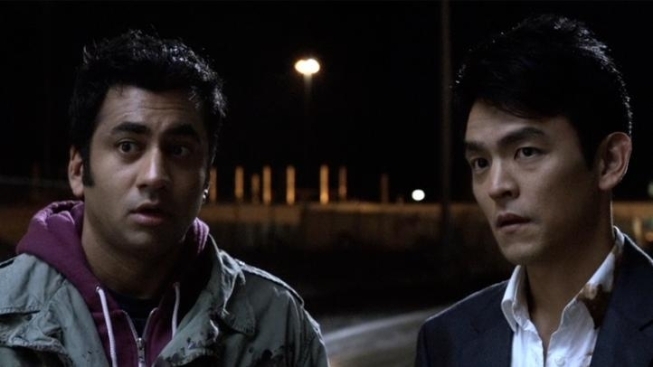 Cho: The trick was that they called the movie 'Harold & Kumar Go To White Castle' and so it reminds you of the other buddy comedies that have preceded us, and the road pictures. So then a serial nature is kind of implicit in that title. I think that's the trick. I don't think we would've gotten to two or three if hadn't had that particular title. Penn: I think the opening sequence was just awesome. We spent a lot of time, and this is going to sound silly, on the smoke with Patton Oswalt's character – the fake Santa – and Kumar are smoking in the mall parking lot. It took a long time to get that right. The graphics guys really enhanced it. Then it turns into the logo! Cho: I'm going to toot the horn for a second: We were not supposed to be in that much of the dance number [with Neil Patrick Harris]. It was supposed to be that we knock down some scenery and then we go into the background. And then we got into the studio and started doing it and we were kind of picking it up to the extent that they thought it would be fun to have them in the rest of the number. So we are in every number. Shebang! Cho: It's really weird to be in more than one franchise because an actor's life is so nomadic, and so it's a real privilege to get back with people. Actually, I think that list has grown because there are more franchises, because they're making more sequels than they used to. I have a couple of movies coming out. 'Total Recall,' the remake of Arnold Schwarzenegger's movie, and 'American Reunion,' another franchise picture. Then we'll get back into 'Star Trek' at some point. I don't know when I'm going to be shooting 'Trek' again, but I think ‘soon’ would be fair to describe it. Penn: I'm working on eight episodes of Neil's show 'How I Met Your Mother,' and developing a workplace sitcom for NBC. So it's a TV pilot script at this point, just in development, and hopefully they decide to shoot it and put it on the air. That's a long shot, always, but we're hoping for good news there. Cho: I love it when people come up - And not necessarily stereotypical stoners. We were having lunch in D.C. in was a very nice restaurant and two guys sent over a burger – they had the chef make a tiny burger and wrote a little note just of appreciation. After it came over, we asked them to be sent over and it was an Asian guy and an Indian guy – who obviously had nice jobs in D.C. and were dressed in suits. And we love that stuff! Penn: It was cool. It was really neat to see, I think that everyone thinks of the fans as just being stoners that are under the age of 25. We love those guys as well, but it's cool to see the different people that like it.